An Orlando businessman is raising money for scholarships for gay students in order to honor the 49 patrons killed during the Pulse nightclub massacre. Barry Miller said the fund would award 10 scholarships each year, each worth $4,900. Students would have to self-identify as "out," attend an institution of higher learning fulltime and have a 3.0 GPA. 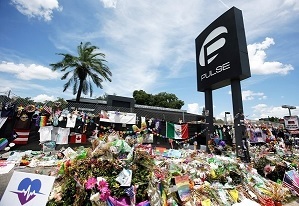 Pulse survivors or family members of victims who died will be given special consideration. Miller is working with the GLBT Community Center of Central Florida and the Central Florida Foundation on The 49 Fund. Gunman Omar Mateen pledged allegiance to the Islamic State during the attack at the gay nightclub in Orlando June 12, 2016. The deadliest mass shooting in recent U.S. history left 49 people dead and dozens more wounded.